In an attempt to answer this tough question, we pulled out a variety of information from various sources. Project management is defined by many things – by the tools it takes to carry it out, the lives it allows project managers to live and the success and failures that it has caused companies to go through. This video infographic is a collection of some of the most interesting and shocking facts about project management. We hope you enjoy it! Please feel free to share this video on your website or social networks – just mention OneDesk as the source. Gillingham, I read that as an ironic comment, but I think you are pretty on target there with your analysis. Don’t forget it targets the wrong thing more often than not. Gillian – Yes, that’s right. The stats have spoken, and while we don’t like to think about it, that’s the reality. Hopefully this video will make people realize this, and try different approaches to project management. Craig – thank you for watching the video, glad you enjoyed it! Thanks for a very useful video, but of course I have to offer some companion thoughts. I make a big deal out of defining “failure.” To me, it’s any negative variance greater than 10 percent on cost, schedule or requirements. But I have witnessed what happens in the actual establishment, tracking and analysis of project metrics. If you don’t fully clarify things things to start with and befog or manipulate communication throughout, then “success” (i.e., disguised failure) is assured. I wouldn’t say project managers and organization leaders are dishonest people, but undisciplined planning/execution/control is far too common — and makes it difficult to be really sure what the hell is going on. 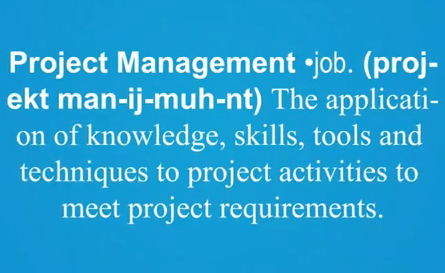 One other point: In the video’s depiction of what it takes to succeed at project management. I agree wholeheartedly with the three factors that were portrayed. But I would most strongly insist that “commitment” and “persistence” are absolutely essential, and must be included. The suggestion that PMs have power to “make the project a success,” is troubling. I work in a rarefied world of US DOD. http://goo.gl/GamCr speaks to some of the problems with program failure. Similar studies have been down on enterprise. PM’s can always benefit from improved processes and tools, but the “real” root cause is much more complex. Tools are important, but they need to be connected with credible processes and competent people – a rarity these days. Jim – Thanks for sharing your thoughts. I agree that there are many more essential components to successful project management – hopefully this brief overview leads people to dig deeper and think about the other essentials. Glen – Thanks for sharing the report. Agreed, competent people make everything much easier! Credible processes are also a must, and sometimes, tools can play a role in making processes credible.